Wayne State University Press, 9780814336205, 104pp. 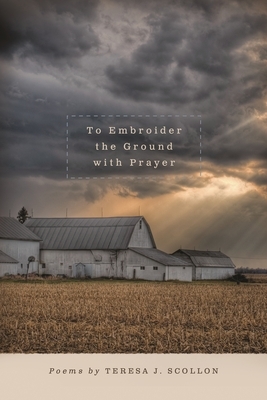 To Embroider the Ground with Prayer is a portrait of poet Teresa J. Scollon's several worlds, as she accompanies her father through his illness and death and records the richness of family and community life in her Michigan town. These poems enjoy reverence and irreverence in equal measure as grief appears side by side with playfulness and humor. Scollon employs a wide range of poetic styles and voices: elegies, narratives, and persona poems are organized in recursive circles that evoke family, village, local characters, and the author's adult life beyond her hometown. The collection begins with personal history and is rooted in a regional voice and focus, but Scollon skillfully transforms her experiences into larger concerns that resonate deeply and universally. Readers will get to know Scollon's father, in fragile health but still so vital to those around him; trace Scollon's many paths into and out of grief; and follow her travels as she confronts the pull of memory and once again forges her way in the external world. Throughout, Scollon records her understanding with fidelity, clarity, and reverence for story, and finds beauty in small everyday acts of devotion, patience, and humility. As Scollon writes, "To capture story is one way of giving thanks, of paying attention, to know where we are." Although this is her first full-length collection, Scollon's stirring work is situated in the tradition of American poetry that includes the likes of Ruth Stone, Wendell Berry, Ted Kooser, James Wright, Carl Sandberg, and Edgar Lee Masters. Readers interested in contemporary poetry will be grateful for this profound collection. Teresa J. Scollon is a native of Michigan's thumb and an alumna and former writer-in-residence at Interlochen Arts Academy. She has received fellowships from the National Endowment for the Arts and Western Michigan University's Prague Summer Program and is author of the chapbook Friday Nights the Whole Town Goes to the Basketball Game. Scollon teaches writing at Northwestern Michigan College and has worked in several fields; she has served as EEO Officer for the Wisconsin Department of Natural Resources and book review editor for ForeWord Reviews.